For many plants, winter pruning is an ideal way to protect them from harsh winter weather and encourage rapid growth in spring. High winds and heavy snow can snap long branches and potentially unroot scraggly bushes. Pruning plants for winter should be done in late fall when most of the leaves have dropped. This makes it easier to see the overall shape of the tree and make clean cuts. Plan to prune your plants before the first frost, to give wounds a chance to harden over before freezing temperatures set in. Clean your tools with boiling water or a bleach solution before pruning your plants. This will help prevent the spread of disease and keep your plants healthy. 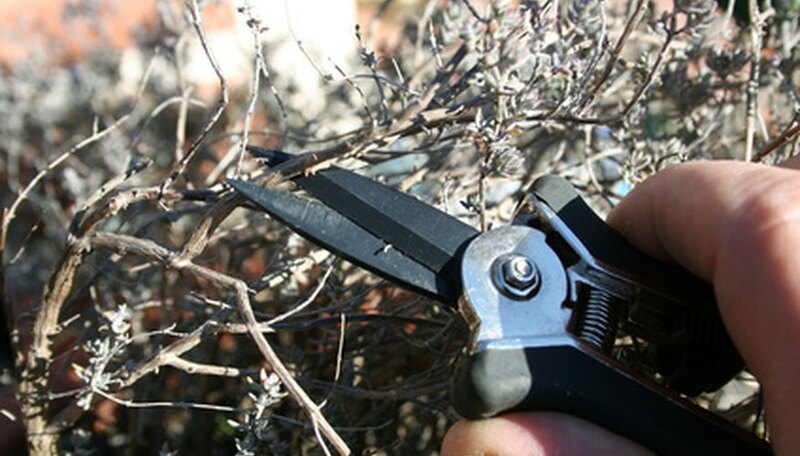 Sharpen your pruning shears two to three times a year to prevent uneven cuts or damage to plants. Remove dead and dying branches by cutting them cleanly off at the base of the stem. Prune off diseased branches as soon as you notice them. Cut well below the diseased area and never leave a stump, which may invite more disease. Cut back hedges and bushes to half their height. Rose bushes especially benefit from heavy pruning before winter in order to grow back vigorously in spring. Young bushes in their first year of growth are an exception and should only be cut back to two-thirds their height. Remove any competing branches of trees and bushes such as those rubbing against each other or growing in the wrong direction. A general thinning out of your trees and bushes will increase air circulation and reduce weight. Prune off any freeze-damaged areas on your plants. This prevents dead weight from hanging around and potentially damaging alive (though dormant) branches. Cut large tree branches in three parts to prevent any damage from falling limbs. Maples, birches, dogwoods, walnut and elm trees do not need to be pruned for winter, as they ooze a sticky sap and make a mess on pruning shears and parked cars.